For the surname, see Gnocchi (surname). Gnocchi (/ˈn(j)ɒki/ N(Y)OK-ee, /ˈnoʊki/ NOH-kee, /ˈnɔː-/ NAW-; Italian: [ˈɲɔkki], singular gnocco) are various thick, small, and soft dough dumplings that may be made from semolina, ordinary wheat flour, egg, cheese, potato, breadcrumbs, cornmeal, or similar ingredients, and possibly including flavourings of herbs, vegetables, cocoa, or prunes. The dough for gnocchi is most often rolled out before it is cut into small pieces about the size of a wine cork. The little dumplings are then pressed with a fork or a cheese grater to make ridges that can hold sauce. Alternatively, they are simply cut into little lumps. Gnocchi are usually eaten as a replacement for pasta in the first course, but they can also be served as a contorno (side dish) to some main courses. Like many Italian dishes, gnocchi have considerable variation in recipes and names across different regions. For example, Lombard and Tuscan malfatti (literally poorly made) are made with ricotta, flour and spinach, as well as the addition of various other herbs if required. Tuscan gnudi distinctively contains less flour; but some varieties are flour-based, like the Campanian strangulaprievete, the Apulian cavatielli, the Sardinian malloreddus, and so on. Gnocchi are commonly cooked on their own in salted boiling water and then dressed with various sauces depending on the type of gnocchi and recipe used. Some gnocchi can be made from pieces of cooked polenta or semolina, which are spread out to dry, and then layered with cheese and butter and finished in the oven. 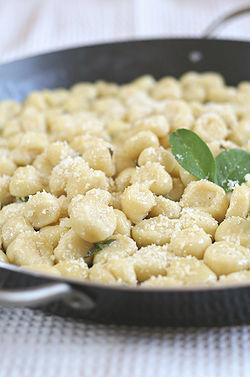 Gnocchi are eaten as a first course (primo piatto) as an alternative to soups (minestre) or pasta. Common accompaniments of gnocchi include melted butter with sage, pesto, as well as various sauces. They are generally homemade in Italian and Italian-immigrant households. They may also be bought fresh from specialty stores. In supermarkets, industrially produced, packaged gnocchi are widely available either refrigerated, dried, or frozen. Gnocchi can be purchased ready-made from grocery stores or they can be handmade. Their preparation is similar to pasta, as they are cooked by boiling them in water and then they are served with a sauce. If miniature gnocchi are wanted for soup, they can be made by pressing gnocchi dough through a coarse sieve or a perforated spoon. A study conducted with the potato puree showed that, between two samples analyzed, the product which engaged in dual lower pressure treatments resulted in the most suitable production of gnocchi in terms of physicochemical and textural properties. However, it did not provide evidence for aggregation phenomena responsible for the hard lumps, which may occur in this type of semi-finished product. Moreover, the textural properties of gnocchi dough were not influenced by the different formulation as was expected. Among the ingredients involved in the preparation of the different samples, what seemed to be the biggest factor affecting the quality features of gnocchi dough was soft wheat flour. As a result of the interactive effect of the ingredients on the physicochemical and textural traits of the different types of dough, a uniform and well-defined division among the samples was not obtained. When comparing the different kinds of gnocchi, the optimal physicochemical and textural properties were detected in the sample, which was made with fresh tubers. Not only was this caused by the use of fresh steam cooked in potatoes, but the pasteurized liquid eggs and the absence of any kind of emulsifier, additive, or preserving substance played a role as well. Gnocchi that are home-made are usually consumed on the same day that they are made, whereas industrially manufactured gnocchi have a shelf life of approximately two months at 2 °C (36 °F). Commercial gnocchi are often sold under modified atmospheric packaging, and may achieve a shelf life of two weeks under refrigeration. One variety, gnocchi di pane (literally "bread lumps"), derived from the Semmelknödel, is made from breadcrumbs and is popular in Friuli-Venezia Giulia, Veneto and Trentino-Alto Adige/Südtirol. 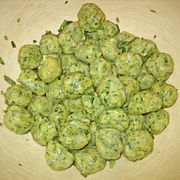 Another variety from the latter region is spinach gnocchi. In Austria, gnocchi are a common main or side dish, known by the original name and Austrian variant, nockerl (pl. nockerln). As a side dish, they may accompany main dishes like goulash. Gnocchi are a very popular and often served as a dish in coastal Croatia, typically being served as a first course or a side dish with Dalmatinska pašticada. The Croatian name for Gnocchi is 'njoki'. An almost identical creation are 'kluski leniwe' ("lazy noodles"), but do not contain egg. Often they are spiced with various herbs like pepper, cinnamon, allspice, etc. Similar in shape are kopytka ("hooves"), simple dough dumplings in the shape of a diamond, which do not contain cheese. Both are often served with sour cream, butter, caramelized onion, mushroom sauce, or gravy. The name is also used in France in the dish known as gnocchis à la parisienne, a hot dish comprising gnocchi formed of choux pastry served with Béchamel sauce. A specialty of Nice, the gnocchi de tantifla a la nissarda, is made with potatoes, wheat flour, eggs and blette (Swiss chard), which is also used for the tourte de blette. La merda dé can is longer than the original gnocchi. Due to the significant number of Italian immigrants who arrived in Argentina, Brazil, Paraguay and Uruguay, gnocchi, ñoqui (Spanish, [ˈɲoki]) or nhoque (Portuguese, pronounced [ˈɲɔki]) is a popular dish, even in areas with few Italian immigrants. In Brazil, Uruguay, Paraguay, and Argentina there is a tradition of eating gnocchi on the 29th of each month, with some people putting money beneath their plates to bring prosperity. Indeed, in Uruguay and Argentina ñoqui is slang for a bogus employee (according to corrupt accountancy practices, or, in the public sector, the distribution of political patronage), who only turns up at the end of the month to receive her or his salary. ^ "Gnocchi". Merriam-Webster Dictionary. Retrieved 2016-01-22. ^ "Gnocchi". Dictionary.com Unabridged. Random House. Retrieved 2016-01-22. ^ "Gnocchi". Oxford Dictionaries. Oxford University Press. Retrieved 2016-01-22. ^ Buonassisi, recipe #877 "Al Pien... si tratta di gnocchi, delicatissimi, secondo un'antica ricetta mantovana..."
^ a b c d e f g Riley, Gillian (2007-11-01). The Oxford Companion to Italian Food. Oxford University Press, USA. ISBN 9780198606178. ^ Davidson, Alan (2014-11-20). "Gnocchi". Gnocchi - Oxford Reference. Oxford University Press. doi:10.1093/acref/9780199677337.001.0001. ISBN 9780199677337. ^ Royer, Blake (April 15, 2010). "Homemade Gnudi from The Spotted Pig". Retrieved 2014-05-12. ^ Farley, David. "The perfect pasta dish Sardinians refuse to share". Bbc.com. Retrieved 15 September 2018. ^ Oxford English Dictionary, 2nd Edition. Oxford University Press. 1989. ^ Serventi, Silvano; Françoise Sabban (2002). Pasta: The Story of a Universal Food. Trans. Antony Shugaar. New York: Columbia University Press. p. 17. ISBN 978-0-231-12442-3. ^ Alessandrini, Laura. "Influence of processing conditions on quality aspects of potato-based fresh pasta." (2010). ^ Alessandrini, Laura; Balestra, Federica; Romani, Santina; Rocculi, Pietro; Rosa, Marco Dalla (2010-11-01). "Physicochemical and Sensory Properties of Fresh Potato-Based Pasta (Gnocchi)". Journal of Food Science. 75 (9): S542–S547. doi:10.1111/j.1750-3841.2010.01842.x. ISSN 1750-3841. PMID 21535629. ^ Ohlsson, T.; Bengtsson, N. (2002-07-26). Minimal Processing Technologies in the Food Industries. Elsevier. ISBN 9781855736795. ^ MacGregor, Sandra (November 5, 2016). "Varazdin: Croatia's 'little Vienna'". The Telegraph. Retrieved November 5, 2016. ^ Gray, Marlene Sorosky (April 4, 2010). "Bay Area chefs put twists on traditional French pastry". SFGate. Retrieved November 5, 2016. ^ McClaughlin, Kate (January 29, 2011). "New World Gnocchi". The Wall Street Journal. Retrieved January 21, 2016. ^ Schneider, Laura (February 4, 2014). "How Eating Italian Gnocchi Became a Monthly Tradition in Latin America". Global Voices. Retrieved January 21, 2016. ^ "'I Am Not a Ñoqui' – The Story Behind the State's Mass Layoffs". Argentinaindependent.com. Retrieved 15 September 2018. Look up gnocchi in Wiktionary, the free dictionary.